Rylands Bridge is a minor waterways place minor waterways place place on the waterways major waterways place village town city on the River Trent (Beeston Canal) between Lenton Chain (Junction of Nottingham and Beeston Canals. The Nottingham Canal used to continue north to Langley Mill from here.) (3 miles and 2¾ furlongs to the northeast) and Beeston Lock No 4 (Beeston Cut joins River Trent) (1 mile and 2 furlongs to the southwest). The nearest place in the direction of Lenton Chain is Thane Road Bridge; 1 mile and ¾ furlongs away. 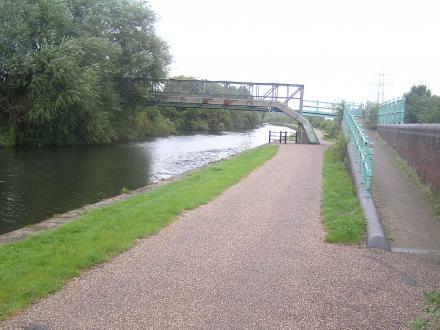 The nearest place in the direction of Beeston Lock No 4 is Beeston Changeline Bridge; 4 furlongs away. The winding hole is in the direction of Thane Road Bridge. Nottingham — 1464 yards to the southeast. Nottingham — 1240 yards to the southeast. Kingfisher Court Sturgeon Avenue, Clifton, Nottingham, NG11 8HE — 1296 yards to the east. London — 1128 yards to the northwest. Nottingham — 1328 yards to the northwest. Clifton Lane, Nottingham, NG11 8NS — 931 yards to the southeast. Nottingham — 962 yards to the east. Nottingham — 1482 yards to the northwest. Beeston, Nottinghamshire — 1381 yards to the southwest. 72A Windsor Street, Nottingham, NG9 2BW — 1217 yards to the northwest. Station Rd, Nottingham, NG9 1 — 1188 yards to the west. Nottingham — 1278 yards to the south. 121 Queens Road, Beeston, Nottinghamshire, NG9 2FE — 1400 yards to the northwest. Nottingham — 1368 yards to the southeast. Beeston, Nottinghamshire — 1289 yards to the northwest. PO Box 9896, Nottingham, NG2 9JW — 1480 yards to the north. East View Terrace, Nottingham, NG16 4DF — 1348 yards to the northeast. Nottingham — 522 yards to the west. D10 Building, Nottingham, NG90 2PR — 708 yards to the north. Clifton, Nottingham, Nottingham — 1278 yards to the south. 131 Queens Road Beeston, Nottingham, NG9 2FE — 1341 yards to the northwest. Beeston, Nottingham — 1012 yards to the west. Nottingham — 976 yards to the southwest. 2A Ireland Avenue, Beeston, Nottingham, NG9 1JD — 1472 yards to the west. Medichecks.com Ltd, MediCity, Thane Road, Nottingham, NG90 6BH — 860 yards to the north. Canalside, Beeston, Nottingham, NG9 1JG — 269 yards to the southwest. Nottingham Trent University (Clifton Campus), Nottingham, NG11 8NS — 896 yards to the southeast.